The following charter, adopted by the EURO Council on 2011.07.10, organizes the functioning of EWGs. the initial EWG board and coordinator(s), being that the coordinators have to belong to an EURO member society. a plan for the activities of the first year. If the Executive Committee thinks that all conditions for the creation of such a EWG are fulfilled, it will formally grant it the EURO label and include it in its list of official activities. The foundation of the group should be announced through the usual EURO’s electronic communication media. EURO does not try to impose unified regulations for Working Groups. Nonetheless, a few general principles are strongly recommended. The EWG's should as far as possible bring together people with different backgrounds: industry, university, etc. They should be actually international in composition; this requirement is met satisfactorily if at least 4, but possibly 5 or 6 nations are represented at each meeting, and if the meetings do not take place too often in the same country. Groups should be open to individual members of any EURO member society. Persons who are not members of a national OR society are not excluded from the meetings; however, a friendly pressure should be exerted upon them to become members. The EWG coordinators have to belong to an EURO member society. EWGs have to run an election for coordinator, every three years, but there are no limits on the number of terms. Each EWG has to define who can vote and how to run the election. If one of the EWG's plans a joint meeting with some other (e.g. professional) body, it should provide EURO with general information about the latter. In some cases EWGs can become the European representatives to scientific associations based in other parts of the world. This must be approved by the Executive Committee. As a general rule, EURO-k Conferences will give the opportunity to EWGs of organizing streams or clusters of sessions on their specific area. Moreover, time and space for meetings of the EWG's may also be provided, if they wish so. Routine internal information about the groups, such as announcements of future meetings and short reports on previous meetings should be conveyed to the Vice-President in charge of Working Group and posted at EURO website. The Vice-President in charge of Working Groups should automatically become a member of all Working Groups during his period of office. This will make it easier for him to keep in touch with the Working Groups. The EWGs will use stationary displaying the EURO symbol and mention their affiliation in all their activities. The EURO Council may accept the existence of Working Groups with closed membership wherever this appears to be justified. The chairman of the group feels that, for some reason, the group can not go on with its activity and he so informs EURO. The Executive Committee ascertains that the group has in fact stopped its activities or has taken a direction that is inconsistent with the goals of EURO. In both cases, the Executive Committee can either try to restore a better situation or remove the group from the list of EWG's. Current administrative costs related with the management and running of the EWG, including printing costs of common stationery and a group specific webpage establishment and management. Costs of the EWG’s specific meetings, organized outside the major OR Conferences, in particular travel and accommodation costs of invited guest speakers (non members of the EWG), EWG members from weak currency countries and early stage OR researchers (actual Ph.D. students and post-doctoral researchers for a period not exceeding two years after their Ph.D. defence). Other costs related with the dissemination and development of the EWG’s area, as costs of initiating and/or publishing results of EWG activities or costs for invited survey contributions on specific EWG related topics to be submitted for publication in EURO journals. Funding for the EWG specific meeting, dependent on the number of participants that is anticipated. The average number of presentations in invited streams organized by the EWG in the EURO K or IFORS Conferences of the previous 3 years. Funding for the organization of a EURO Summer/Winter Institute. Number of special issues of highly reputed scientific international journals, promoted and organized by the EWG and published in the previous year. Other initiatives that the EWG may propose to the EC in their activity plan. As some of the budget components refer to future activities, and rely on indicators not available when the plan of activities is presented, the total funds assigned to the EWG will be calculated in the end of the year based on the activity reported in each EWG section of EURO’s webpage, where all the information concerning meetings organization, EURO K and IFORS streams organization, special issues edition and other relevant initiatives should be posted. Any difference between the final funding value and the budget previously assigned will be considered as a balance to compensate in the following year budget. The funds will be paid out by the EURO treasurer to EWG coordinator, after approval by the EURO Officer responsible for EWGs, against a receipt signed by the EWG coordinator, mentioning the activity indicators on which the budget was calculated. 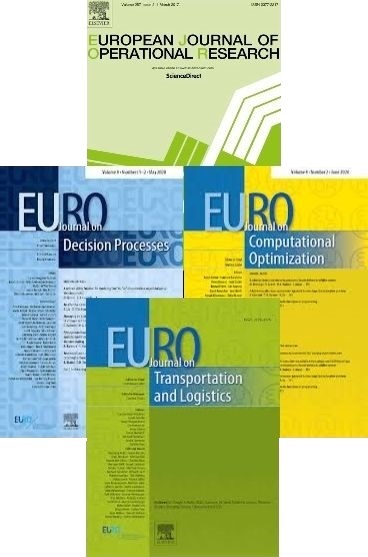 EURO also encourages and supports activities that can further the scientific objectives of the EWGs, promote their activities and raise funds, namely EURO Mini Conferences.